Alfa launches special-edition Spider | What Car? Alfa Romeo has revealed the Alfa Spider Limited Edition, which it says features 3000 of additional kit for no extra cost. Over and above the standard car, the Spider Limited Edition has 19-inch alloy wheels, leather upholstery, electrically adjustable and heated memory front seats and door mirrors, and Bluetooth connectivity. It is powered by the standard 185bhp 2.2-litre petrol engine, propelling it from 0-62mph in 8.8sec and on to a top speed of 139mph. 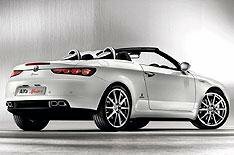 The Alfa Spider Limited Edition costs 25,500, the same price as the standard 2.2-litre car. However, if you're looking to haggle on the price, you'll find it harder to achieve a discount on the limited-edition car.